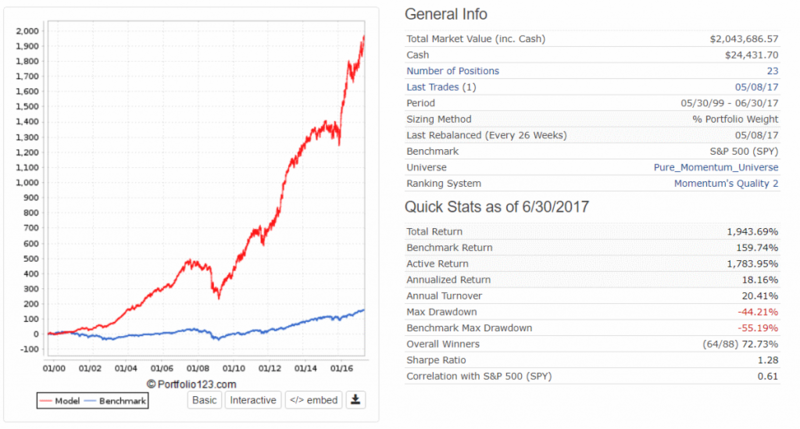 Quantitative Momentum Strategy – What is it? Following is an example for Quantitative Momentum portfolio returns, for a period of 18 years, from May 30th, 1999, to May 30th, 2017. An astounding 18.16% average annual return vs. the S&P 500 returns of 5.42% during the same 18 year period. 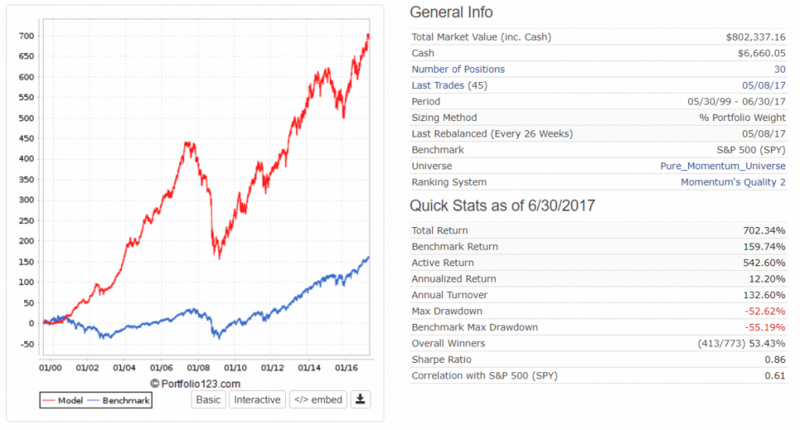 A Sharpe ratio of 1.28, with a lower volatility and max drawdown than the market. Moreover, those results were achieved with asset turnover of 20% (i.e., selling and buying only 20% of the holdings every year) which ensures low taxes and low transaction costs. We believe that those results are fantastic. We define Momentum as the % change in a stock price during the last 12 months, excluding the most recent month. For example, to calculate the momentum of stock XYZ at the end of December 2017, we will look for the change in stock price between January 1st, 2017 and November 30th, 2017. We exclude the most recent month (December 2017 in our example) due to the “inversion effect” – stocks that were winners in one month, tend to be losers in the following month. Excluding the most recent month improves the average performance of Momentum portfolios. The merits of momentum were first published by Robert Levy in 1967 but received public attention. Only when Jegadeesh and Titman published their ground-breaking paper Returns of Buying winners and selling losers in the early 1990’s, has Momentum emerged as a prominent stock factor, spurring tons of research. 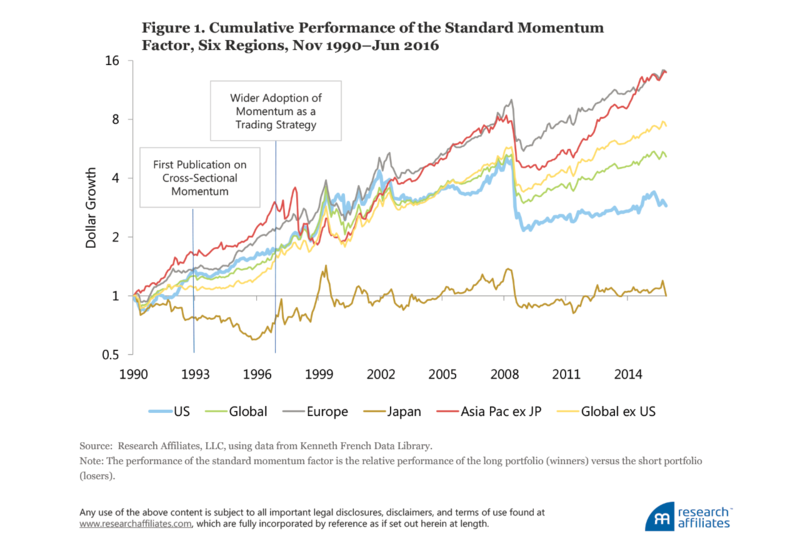 Since then, Momentum was shown to have performed well in any asset class, and in every market (even in Japan, with some adjustments). The span of academic research on momentum is overwhelming. We will try to cover the key findings on our blog. Momentum portfolios deliver ultra-high returns. The return potential of momentum portfolio is truly hard to grasp. Our backtesting simulation shows historical average returns of almost 20% per year. It is thus not surprising that aspiring investors wishing to maximize their portfolio return potential will favor momentum portfolios. Yet momentum is not a free lunch. The volatility of momentum portfolio is rather high. Simple momentum portfolios have lost 60%, 70% or more during the 2000 and 2008 crisis years. We can think of no investor (not even ourselves) who would stay invested through such massive swings. Even with our refined implementation of momentum, where we’ve taken measures to reduce it, volatility is still higher than that of the market and that of Value Investing Portfolios. The outperformance potential of a momentum stock holdings fades out rather quickly. Momentum holdings stop beating the market after being held for several months. Thus, many momentum investors rebalance their positions every three months. Our Quantitative Momentum model allows us longer rebalance periods, of six months, a term which is still shorter than the annual rebalance period of typical Value Investing models. Momentum has one characteristic which makes them compelling to everyone, both conservative and aggressive investors – Momentum has a low correlation to Value. 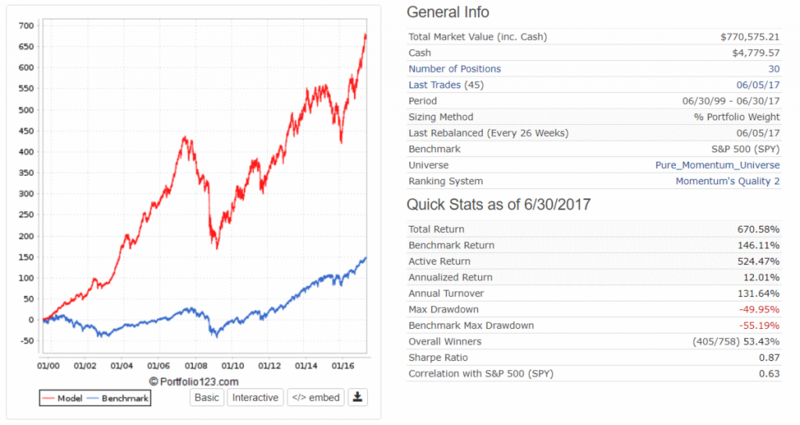 Momentum portfolios and Value portfolios behave differently. 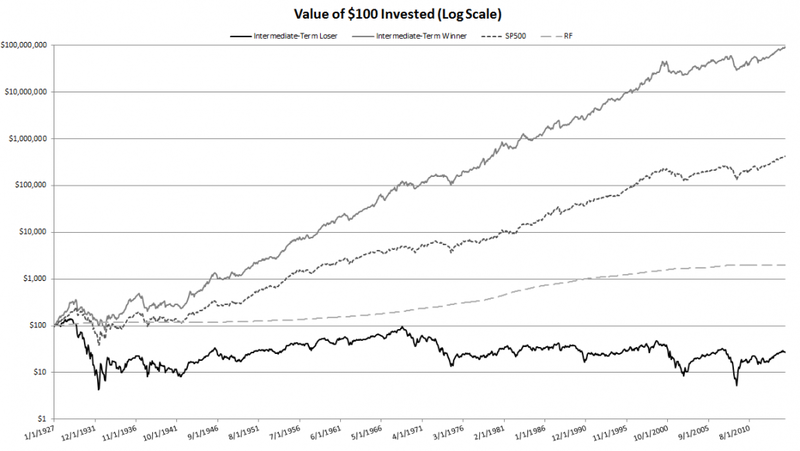 Occasionally, when a value portfolio rises, a momentum portfolio declines and vice versa. When constructing a portfolio comprised of a Value portion and a Momentum portion – the volatility of the overall portfolio will be lower than each of its components, increasing risk-adjusted returns. Investing in a Momentum portfolio alongside Value portfolio maximizes returns and minimizes the overall volatility. Everyone will benefit from allocating some of his or her funds to a momentum portfolio. Conservative investors, as well as aspiring investors, will both benefit from the overall reduced volatility and lower drawdowns. Why Does Momentum Perform so well? It’s relatively easy to develop intuition to why Value Investing outperforms. According to Prof. Ariely, prof. Kahnmann and other behavioral economists, human behavior is irrational, and predictably so. It is not unreasonable that investors dump bad stocks too quickly. Value investing thus capitalize on the overreaction of investors to bad news. People place a bigger emphasis on bad news than on good news, and companies which have suffered from severe financial results are likely to see their stocks decline to a large extent. Institutional investors do not like holding losing positions, and will often get rid of them, regardless of price, to chase other short-term returns. But why does momentum outperform? The leading explanation today, attributed to Grey and Vogel, is that investors tend to under-react to good news. When a company emerges from adversity, its stock price rises. Grey and Vogel claim that most investors will stay skeptical and wary for a while, resulting in prices failing to realize the full potential of the company immediately. The skepticism and fear will fade away over time, resulting in a slow realization of value. Investing in both Value and Momentum involves front-running investor expectations. With Value Investing, we expect stocks to revert to the mean and appreciate before those expectations are met. Similarly, with Momentum Investing we expect stocks to realize a higher value before those expectations become commonplace. Not every momentum portfolio was created equal. Not every momentum portfolio performs well. Simple momentum strategies that crushed the market during the 20’s through the 90’s have changed course and have been lagging the market since 2000. Only careful momentum implementation, one that relies on findings in recent academic studies, continues to perform well. When buying a momentum ETF or mutual fund, investors should be familiar with its implementation specifics. Most momentum ETFs do not exploit the full potential of the momentum factor. In this section, we shall describe step-by-step how we implemented a momentum portfolio through applying cutting-edge research. 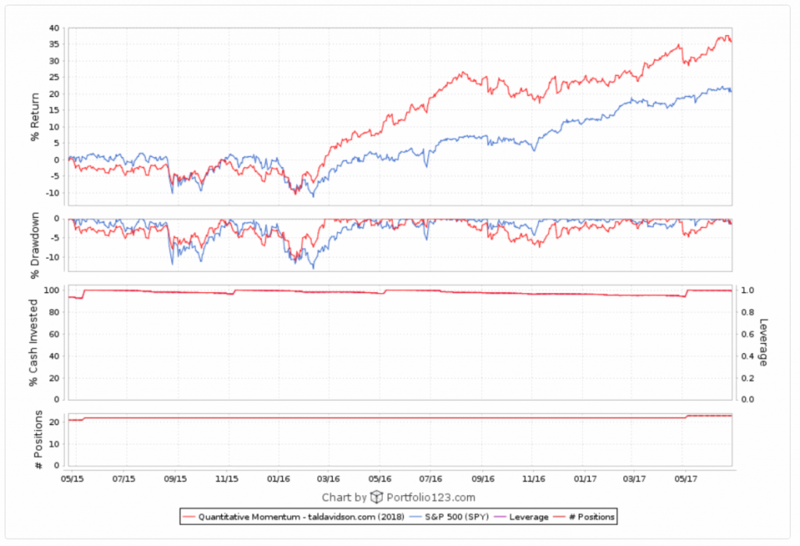 We start by performing a backtesting simulation, re-creating a simplistic momentum portfolio. The simulation spanned over 18 years, from June 30, 1999, to June 30, 2017. The model selected 30 stocks which have appreciated the most during the last year, excluding the most recent month. The portfolio was rebalanced every six months. We excluded the 40% of smallest stocks, which corresponds to a market cap limitation of $200M today. The performance of the portfolio is everything but compelling. This momentum portfolio lagged the S&P 500 by more than 5% per year and resulted in a high volatility and excessive asset turnover. The practice of excluding the most recent month in the calculation of momentum is consistent with the academic research showing that month-to-month stock performance tends to invert. Previous month losers tend to be winners in the following month. Previous month winners tend to be losers in the next month. Research shows that although momentum stocks were big winners since 1927, they have faltered since 2000 resulting in meager returns, especially considering their high volatility. The following graph shows how simple momentum has performed since 1927 on a logarithmic scale. Source: Quantitative Momentum (2016). The chart shows the invested growth of intermediate term momentum (2-12 month lookback) from 1927 to 2015 using data from Ken French’s website. The graphs above show that momentum can work well for years, but then can come a bad year (like 2008) and erases the returns of a decade. Inspired by a Wes Grey and Jack Vogel’s article, Swedroe Spotlight: Enhancing Momentum Strategies Via Idiosyncratic Momentum, which summarizes the recent research in the field, we have tweaked our momentum selection criteria to apply an idiosyncratic momentum criterion. We now take the stock returns over the last year (excluding the most recent month) and subtract from it the multiple of the stock’s beta and the S&P 500 returns during the same period. Thus, we normalize the stocks’ momentum to a common volatility baseline. Any momentum that remains after normalization is resulting from a stock’s unique situation, therefore regarded as idiosyncratic momentum. Our formula is not EXACTLY what researchers have proposed, but a reasonable simplification. 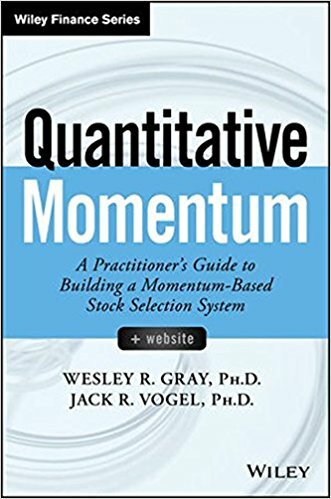 Grey and Vogel’s book, Quantitative Momentum, proposes several improvements to the momentum strategy which significantly boost returns. The most significant one is instead of choosing the stocks with the highest momentum (returns during the last year excluding the most recent month), take the highest decile of momentum stocks and select the stocks with the highest momentum quality. Grey and Vogel rely on research showing that stocks with appreciate slowly, without spikes and jitters, perform better. We have implemented a unique momentum quality factor. While it somewhat differs from Grey and Vogel’s implementation, it is simpler and delivers the same desired outcome. The following figure summarizes a simulation in which we select the stocks with the higher momentum quality out of the top two decile of stocks with the highest momentum. All the other parameters stay as before. The results speak for themselves. The portfolio gained 12% per year, vs. the S&P 500 with just over 5%. Nevertheless, it has done so with mind-blowing volatility and a high asset turnover rate of 131.64%. Next, we shift the rebalance dates a month earlier, to benefit from the calendarization date of momentum. 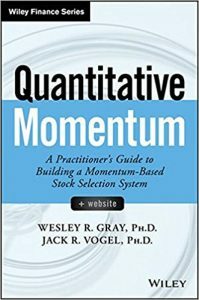 Research shows that momentum stocks perform less well during the last month of each quarter, probably due to portfolio managers’ tendency to sell winning stocks by the end of a quarter. If we keep the rebalance dates a month before the end of a quarter, we earn a few more basis points a year. The following simulation started on May 30th, 1999 and rebalanced every end of May and end of November. It spans 18 years and a month, ending on June 30th, 2017. Annual returns grew to 12.2% and Sharpe ratio remained about the same. The following improvements are based on our own novel research, and yet to be explored by academic researchers. We add an additional momentum criterion. Stocks should be 50% of stocks with the highest quarterly and bi-quarterly (idiosyncratic) momentum. Also, now we apply advanced sell rules, aimed to reduce the asset turnover rate. When the time comes for a rebalance, we sell the stocks which have a Quarterly Momentum Rank of less than 50, meaning that if we sort all the stocks according to their quarterly momentum, they will be in the lower half. Lastly, we added Buy rules which eliminate stocks having horrible quality – those that had a very low return on capital over the last five years and those who rank the lowest for piotroski’s score (modified version as suggested by Carlisle and Grey). Average annual returns have increased to 16.55% per year. Sharpe had grown to 1.14. Asset turnover rate was reduced from 150% per year to a reasonable 20%. How would our Quantitative Momentum (QM) model perform year-over-year? Month-Over-Month? What performance should we expect? Let’s dive deeper into the past performance of the QM model to search for clues. We will perform our examination on a portfolio of 20 stocks with market caps above $200M, rebalanced every 6mo. It is evident that the portfolio performance has a low correlation to the market on a month-to-month basis. During half of the time, the QM portfolio earns higher monthly returns than the benchmark, and in the other half, it earns lower returns. 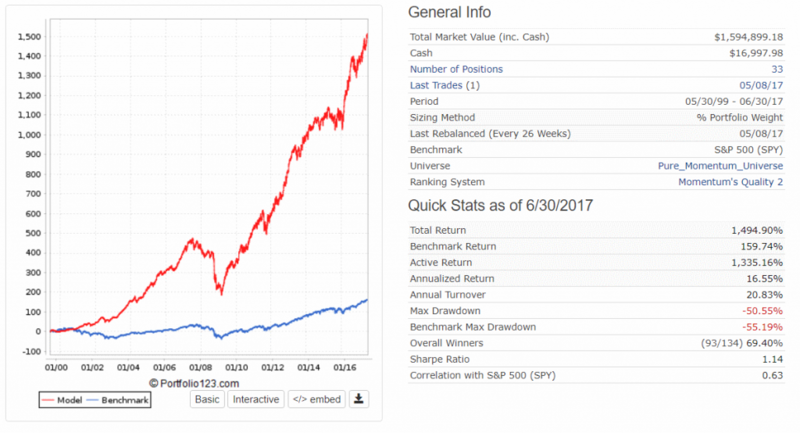 On the last 12 months of the simulation, the portfolio lagged the market on 7 out of 12 months. On a year-to-year basis, the picture looks different. 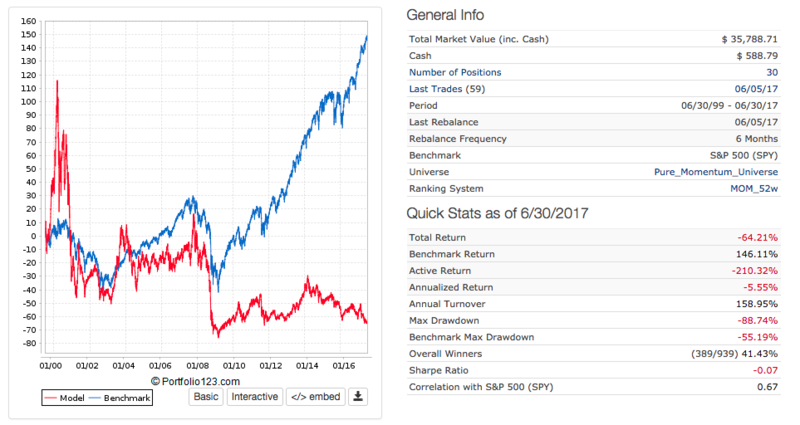 The QM portfolio beats the S&P 500 benchmark in 12 of the 18 years we simulated. Nevertheless, During 2012-2015 it lagged the market for three years in a row (!!!). Holding a QM portfolio thus requires a long investing horizon. It cannot beat the market in every single year. It works because it doesn’t always work. Let’s now deal with the volatility of our QM portfolio. Volatility corresponds to the extent which the total portfolio value fluctuates relative to the market’s fluctuations. Investor measure volatility through the standard deviation of the portfolio value. A high measure corresponds to higher volatility. Volatility should not concern rational investors with long investing horizons. Those should be able to ignore short-term capital value gyrations. But, for humans, volatility DOES play a role. Many find it mentally challenging to hold a portfolio which suffers steep declines and may lag the market by 10%, 20%, even 30%, even if only on a temporary basis. The % Drawdown measure (in y-axis) reflects the extent of the decline compared to the peak price achieved. One can see that in some of the times the QM portfolio declines were more profound than the benchmark. However, the QM portfolio always managed to recover and surpass the benchmark, yielding higher returns over the last three years.